Seattle Central College is home to many diverse artists, some with a rich personal history of involvement with the arts. Other student artists have found their talents through an introductory or continuing education course here at Central. What all of these student artists have in common is a passion for their craft and a desire to hone their skills. Occasionally, an artist stands out, whose talent cannot be ignored. Nicole Martina Beijbom is one of those artists. Nicole is an international student who moved here from Sweden in April of 2016 and enrolled in the Web Design program here at Central. 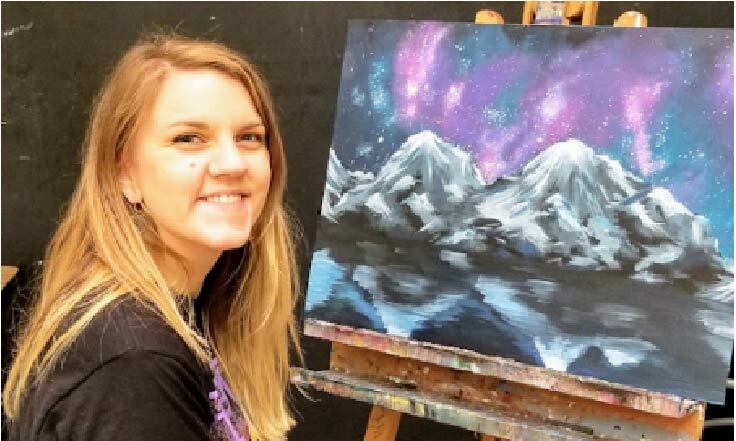 While she has been drawing since childhood, Spring Quarter 2018 was her first real attempt at painting. Before that course, Nicole’s primary focus has been on portraiture. 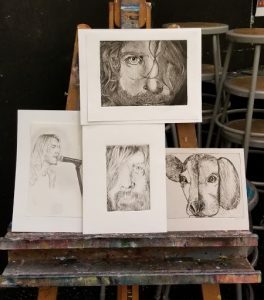 One of her favorite subjects happens to be Seattle’s grunge music scene from the ‘90s, where she captures candid moments of recognizable Seattle musicians like Kurt Cobain. 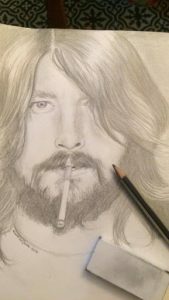 One of Nicole’s prints of musician Dave Grohl earned her an honorable mention earlier this year in the M. Rosetta Hunter Student Invitational. 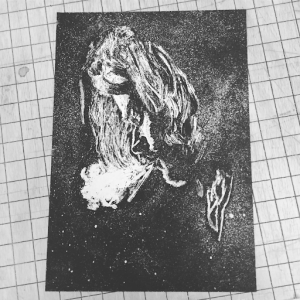 More recently, Nicole has begun working on pieces with a message that she feels passionate about communicating to the world. I sat down with Nicole to find out what was the main drive behind her art, what her plans are for the future and to see what was on her bucket list. I’ve done art my whole life, but the sort of confidence boost I needed I got when I first came to Seattle. When did you get interested in art and when did you actually start practicing? Growing up I always knew that I wanted to be on the stage or I wanted to be an artist. I just wanted to do something in the arts. Then along the way, I hate to say that I sort of lost that because you’re told that you can’t. Especially where I come from I feel like it’s a very common thing to say, “Well you’re gonna be unemployed, and you can’t make a living.” I’ve done art my whole life, but the sort of confidence boost I needed I got when I first came to Seattle. I mean I’ve always been encouraged to pursue or to work on my art. But when I moved here, I moved to Capitol Hill, and it’s such an artsy neighborhood. I mean its a very artsy city and there are so many opportunities to grow as an artist. There are so many communities and so many great art classes here at the college, and there are the art walks. There are just so many opportunities and so many good artists to work with. So I guess I started taking it really seriously after I first moved here. Are you pursuing a career in the arts or something people would consider more “practical”? I started believing that you can’t make a living as an artist. That’s why I left that idea a while ago, and I thought that maybe I can work in something that’s remotely related to the field of art or close to what I want to do. Then I came here and I still had that desire in me and I guess that’s what I realized while in the web design program. I made that choice because “Ok this is kinda creative but it feels safer in a sense.” And there’s nothing wrong with the web design field or the work. I mean it’s creative but it’s creative in a different way. It’s just not artistic enough for me personally. It’s all fear based. It’s all about listening to those doubts, but in the end, I truly believe, and I know it sounds cheesy, but what’s really going to get you through is passion. You can have a job that is sort of ok that you’re sort of happy with and that’s totally cool, but when it gets boring and when it gets hard when you do something you’re passionate about you’re going to find the motivation to keep going. I think you’ll get more satisfaction and more happiness with having passion and feeling like you have a purpose with what you’re doing. What are your career goals and future plans at this time? I’m finishing my AA program in Web Design then I’m applying for the graphic design program because that’s what I really want to do. I’m applying for several programs, but I’m hoping for the SCC one because that’s the one I really want to do, and I know they have a great program. The majority of students get work quickly after they’re done. You have to submit a portfolio, but they don’t accept new students until next fall, so I have a lot of time to prepare. I’m an international student and can’t wait another year. I have to be accepted into a program but I also do have to have a BA to get a work visa. There are some exceptions, but not when it comes to this line of work. Possibly, if I were to get sponsored by a company, but a bachelor’s degree is really what I’m hoping for. Can you tell me about the type of art you enjoy creating and what influences you? I usually work with portraits or pieces like the painting with the mountains here. I like an element of magic or mysticism. I like to capture people that I admire and see them in a different light. Like you always see pictures of like Chris Cornell belting it out or singing, which I love drawing that, too but with this print, it’s more like, I dunno it’s more personal. I’ve always been a fan of the whole Seattle grunge music scene and all that, and I’ve focused more on that since I moved here. Especially after Chris Cornell died. This print of him I started making the day that we found out that he died so it’s sort of my tribute to him. He’s my favorite person to draw. I mean Chris Cornell was a beautiful man, his personality and I like his features. I like drawing him a lot. Have you met anyone of artistic significance since moving to Seattle? Since I moved to Seattle I’ve met Matt Cameron and Mike McCready from Pearl Jam, which is like huge! I’m a girl from a small town in Sweden who has met, basically her idols, since she was thirteen. When I met Mike McCready, I was at Easy Street Records and there was a band playing and he sort of is friends with them, I guess. He saw that I was a bit nervous and so he came up talking to me and made me feel instantly comfortable. I asked for a picture and he gave me a few guitar picks, too. Matt Cameron, I met at this drummer’s podcast at KEXP, and after there was an autograph signing thing. I don’t think I said much. Are you also a musician or is music solely an artistic inspiration for you? No, but I have a guitar back at home that I miss. And one of my bucket list items is to become a drummer. Like I wanna play the drums! Dave Grohl, Taylor Hawkings, Matt Cameron, they’re like the drum gods. My boyfriend has a digital drum kit, he’s a drummer and he actually bought me a drum and a practice pad and some sticks, so I don’t have any excuses anymore to start practicing. I need to do that. Before I moved here, I would never have called myself an artist. As an artist, do you have a message that you want to convey through your work? That’s something that I struggled with. Before I moved here, I was reluctant to call myself an artist because I felt like if I didn’t do it professionally, I didn’t deserve to, at least that’s how I felt. But I was wondering if you were going to ask what message I wanna get out, so I was thinking about that. I’m a very passionate person and I have a lot of things that I want to get out there, especially things that are personal to me. The cow-dog print, Perspective, is the first time I’ve put some art out there that’s really something that is an important statement for me to make. 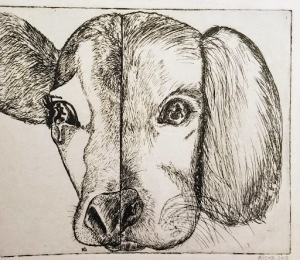 It’s a print that I made in my printmaking class and I wanted to touch on how we treat animals differently by species, like speciesism. Some people are outraged by the fact that some countries eat dogs, but at the same time, we do the same to cows and pigs and everything. It’s just seeing it from that perspective. I don’t know if you can tell, you have to look up close, but the cow has the reflection in the eye of someone with a knife coming towards them and you can see them crying because they’re getting slaughtered. And the dog eye has someone coming for them, but with a bowl of dog food. I usually say I’m vegetarian because I feel like a hypocrite saying I’m vegan because I’m vegan like 90%. I don’t buy any animal products, but if you know every now and then, if something slips in like egg or milk, ok. But no animals at all, no meat.